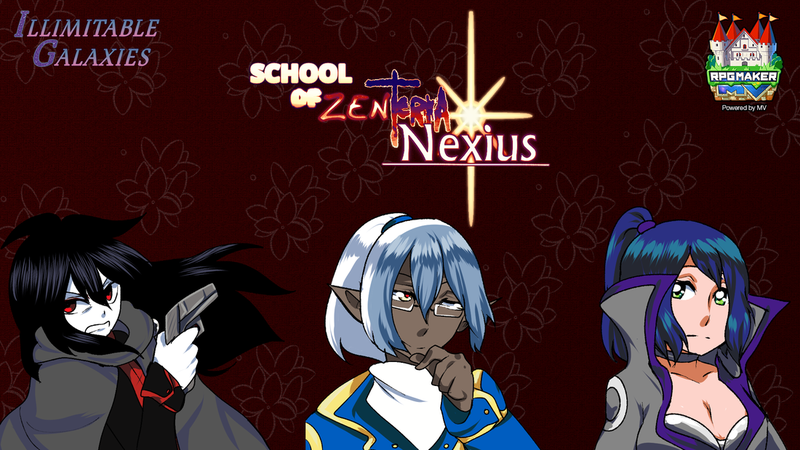 School of Zenterianexius is a fan-game based on the webcomic Zenchav Out of Order by Draco Plato, the webcomic Psychteria by CalimonGraal, and the unwritten novel ExtroNexius by RebelVampire. In the game, you take the role of Damon, Cali, or Freyja. Regardless of who you pick, all three characters, along with some of their friends, find themselves whisked away to a mysterious school where they must join forces in order to escape and make it back home. The game is intended for fans of either Zenchav Out of Order or Psychteria, so if you aren't familiar with those webcomics, some of the game story may be hard to follow. ExtroNexius cannot be read (particularly the arc the characters are from), so pay it no mind. The game was made over the course of a year and a half. This is the second time RebelVampire has attempted combat mechanics. The balance could be better, but for a second try it's okay! Promotional Images contain assets made by CalimonGraal. Please be sure to thank Cali for the nice images~! -Solve a simple variety of puzzles to advance through the story and help the characters escape! -Find various weapons throughout to maximize your damage capacity! -Battle a variety of monsters in on-map encounters! -Form your ideal team between 12 characters! -A few areas have flashing green orbs. Interacting with these orbs let's you rest and recharge your HP and AP. -Be on the lookout for sparkly things! -While you have to have either Damon, Freyja, or Cali in your party, later on you can change the party composition with "Formation" in the menu. -In the school, the goal is to find a certain number of clues to advance the story. -Stuck in the woods? Check the lake area where you'll find a device that lets you change the time! -There's no shame in retreating to rest up! Bugs? Send bug reports to rebelvampiresay@gmail.com. Please include a description of where you are in the game and the exact nature of your problem. Screenshots help also.